Laura Dakin runs the galley on the Steve Irwin, one of Sea Shepherd’s anti-whaling vessels. In Cookin’ Up a Storm, Dakin shares her culinary secrets, as well as humorous and informative accounts of a life spent at sea, protecting whales, seals, turtles, sharks, and dolphins. If you’re saying to yourself that I own more than enough cookbooks by now, you’re probably right. Totally right actually. But I just can’t help myself! Also, Cookin’ Up a Storm is unlike any other vegan cookbook I’ve seen, in that it’s as much a chronicle of Sea Shepherd’s anti-whaling campaigns as it is a cookbook. There are tons of photos of marine life; interviews with the crew; sailing terminology; and a glimpse of everyday life on board the Steve Irwin. The cookbook is divided into seven parts, with sections dedicated to morning starters; soups; mains; salads and sides; sauces, spreads, and condiments; breads; and sweets and treats. 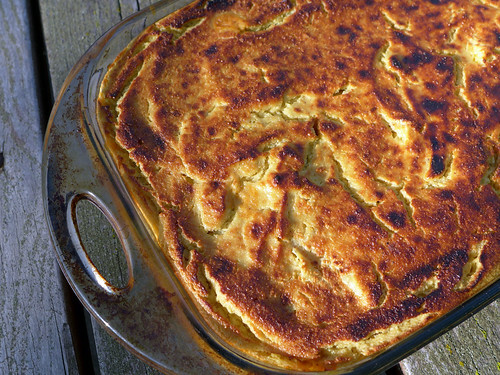 From a warm and cozy Sea Shepherd’s Pie to meaty Sailors’ Delight Sausages and savory Boatload of Butternut Caponata, Dakin’s got her crew covered. In case you hadn’t caught on, many of the recipes have nautical and/or activist-inspired names, which is kind of fun and furthers the “eating at sea” theme. I don’t belong to a CSA (community-supported agriculture), but I have kept a summer garden religiously for the past 14 years, with the setup ranging from over-the-top, wth-was-I-thinking ambitious to more modest container gardens. My most popular picks are tomatoes, zucchini, butternut squash, spaghetti squash, and peppers, but I’ve also experimented with cucumbers, pumpkins, watermelon, cantaloupe, corn, asparagus, and gourds. I also have a few fruit trees: apples, pears, apricots, and one peach that was sadly on its last legs when we moved in (rest in peace). Most years I end up with more produce than I can possibly hope to consume fresh. My strategies for dealing with the extras run the gamut, from adding them to our dogs’ food (veggie stew + their regular kibble = more volume, without the extra calories; also the gravy is great for the oldest two, who haven’t managed to hang onto all their teeth); washing, dicing, and freezing for later; making dehydrated snacks, including fruit leather; and donating it to the local food pantry (one year we delivered upwards of 500 pounds of apples!). Even so, come August and September the pressure not to waste the food I’ve worked so hard to grow and gather can get pretty intense. Let me start out by saying that, as a vegan, what drew me to The Geeky Chef Cookbook wasn’t so much the recipes as the intersection of food and pop culture. Two of my favorite things, made exponentially better when mashed up together! I wouldn’t exactly call myself a chef, but I do love to play with my food, and I’m no stranger to veganizing and recipie-zing (is that a word? can we make it one?) foods from my favorite books and television shows. 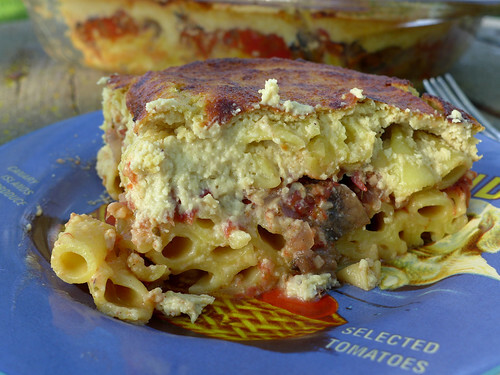 To wit: last year’s VeganMoFo theme, Carbs & Rec, in which I blogged foods found in and inspired by the always-awesome Parks & Recreation (may she rest in peace). 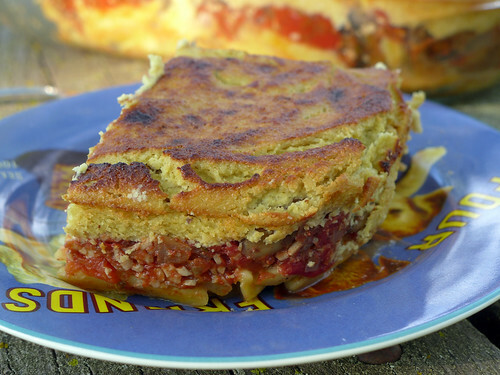 There were Mac & Cheese Pizzas, Meat Tornadoes, Champion’s Peanut Butter Oatmeal Birthday Biscuits, You Just Got JAMMED! Kolaches, and of course waffles galore. One of these years, I’d love to do a His Dark Materials theme, but the pressure! It’s so intense! I want everyone to love Lyra and Will and Mary and Iorek as much as I do! I’d even settle for half as much. I feel like it’s my chance to introduce some vegans and veg-curious peeps to this amazing alternate universe, and I don’t want to screw it up. Anyway. My point is: Pop culture and food? Totally my jam. Even though I thought it unlikely that I’d actually make anything from The Geeky Chef Cookbook – or at least precisely as directed – I suspected I might enjoy it anyway, maybe even come away with some new ideas and a list of recipes to veganize. 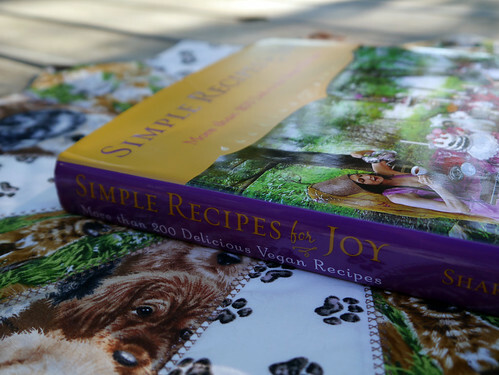 Sharon Gannon’s Simple Recipes for Joy: More Than 200 Delicious Vegan Recipes is nothing if not quirky – and I mean that in the best way possible. 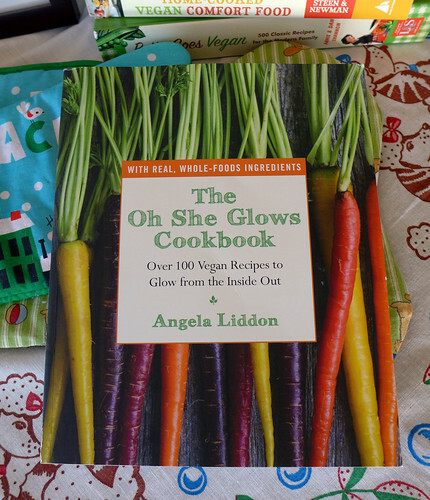 The cover features a Mad Hatter-style vegan tea party, and the interior of the cookbook has a fun, funky ’70s vibe. The glossy pages include tons of mouth-watering food photos, as well as shots of the author, both at work (Garon co-founded the Jivamuktea Café in NYC) and play (her costumes will leave all the hippie chicks in awe). The 200 vegan recipes are divided up into fifteen sections: soups; pasta and sauces; salads; dressings; dips and spreads; grains; beans, tempeh, tofu, and seitan; vegetables; potatoes; toasts; sandwiches; quick bread and crackers; desserts; smoothies; and tea and other hot drinks. Also included are a FAQ; cooking tips; notes on a well-stocked kitchen; 30 sample menus; and 21-day cleansing diets. Since I first got to know Simple Recipes for Joy during the cold winter months, I veered heavily towards the soups and pasta dishes. At 50 pages, the chapter on soups is easily the largest – and one of my favorites. Save for the Cream of Broccoli Soup – which was tasty enough, but made me all kinds of bloated – every recipe proved a winner. 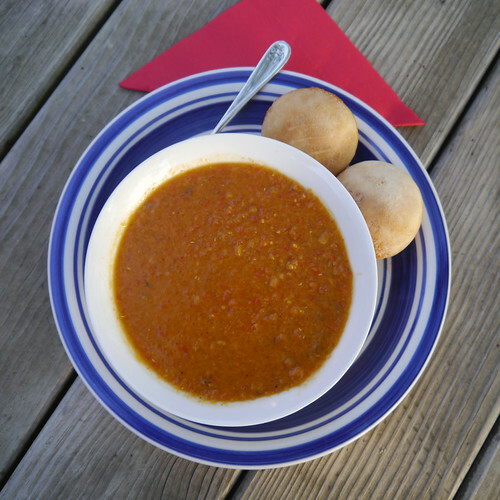 The Red Lentil and Tomato Soup was awesome, and helped me to polish off a whopping two pounds of my homegrown tomatoes. It’s a little on the thin side, though; for a heartier soup, I added an extra cup of red lentils toward the end of the cooking cycle. That gave them just enough time to cook, but not dissolve entirely, like the first batch. I went vegetarian in 1996, vegan in the mid-aughts, and have been allergic to milk my entire life. And I love pizza! (Yes, vegan pizza exists. And it is glorious!) Whether it’s a quick pita or French bread pizza, or a complicated, labor-intensive original gourmet dealio (mac & cheese pizza, anyone? ), my husband and I enjoy pizza at least once a week. I have a tumblr dedicated to vegan pizza (along with my other favorite, vegan ice cream), and Vegan Pizza Day is a legit holiday in my house. Some of my coziest childhood memories involve making pizza from scratch with my mom, a routine we revisit every time I return home. I picked up a copy of Tony Gemignani’s The Pizza Bible in hopes of upping my pizza game. While I didn’t have any illusions that the recipes would be vegan-friendly (although, in a book dubbed the Bible, I don’t think it’s altogether unreasonable to expect the author to at least mention alternative pizzas, whether they be vegan, vegetarian, gluten-free, or raw; “Bible” implies exhaustivity, no? ), I thought that perhaps some of the dough recipes might be accidentally vegan. I’m happy to report that I was not disappointed on this front! 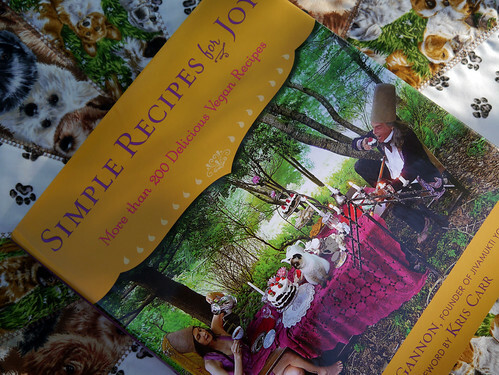 A hearty shout-out to Avery, which sent me a copy of one of its upcoming vegan titles: Simple Recipes for Joy: More Than 200 Delicious Vegan Recipes by Sharon Gannon, the founder of Jivamukti Yoga and the Jivamuktea Café. 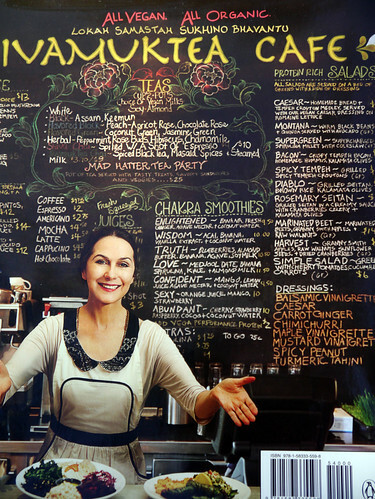 As much as I love the book’s Mad Hatter-styled cover, I positively adore the photo on the back of the dust jacket, which shows the proprietor beaming from the Café’s front counter, standing right in front of a chalk board jam packed with the names of delicious vegan dishes. SO MUCH VEGAN FOOD. Every vegan’s favorite food and dining app* finally gets the cookbook treatment** in The HappyCow Cookbook: Recipes from Top-Rated Vegan Restaurants around the World. Founded in 1999, HappyCow.net allows users to search, rate, and add to its directory of vegan and vegan-friendly eateries (and stores! ), making dining out as a vegan a wee bit easier. The HappyCow Cookbook features profiles of and recipes from some of the many eateries found on the website. 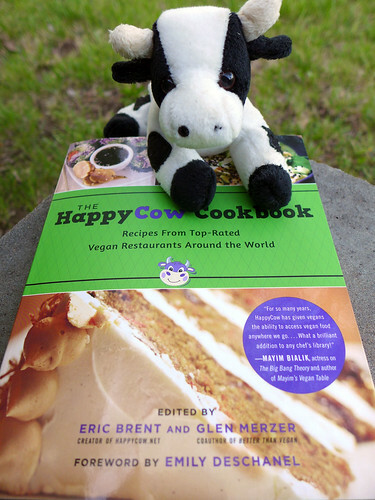 Just as HappyCow.net is international in scope, with listings across the globe, The HappyCow Cookbook doesn’t stay stateside. Among the international joints it highlights are Buddha Burgers in Israel; Germany’s Coox and Candy; and El Piano, in Spain. In the US, restaurants in thirteen states make the cut; this includes not only the usual suspects (New York and California), but also less obvious locales (Texas, North Carolina). Actress-slash-neuroscientist-slash-vegan mom Mayim Bialik makes her foray into the vegan cookbook market with Mayim’s Vegan Table: More than 100 Great-Tasting and Healthy Recipes from My Family to Yours. (She previously published a parenting guide, also with pediatrician Jay Gordon, called Beyond the Sling: A Real-Life Guide to Raising Confident, Loving Children the Attachment Parenting Way.) 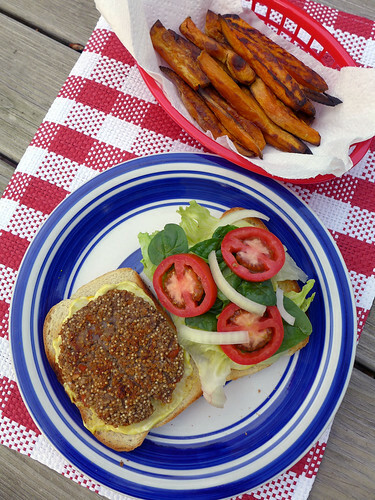 With an emphasis on quick, easy, nutritious meals, the dishes found in Mayim’s Vegan Table are likely to appeal to families on the go and newbie vegans. 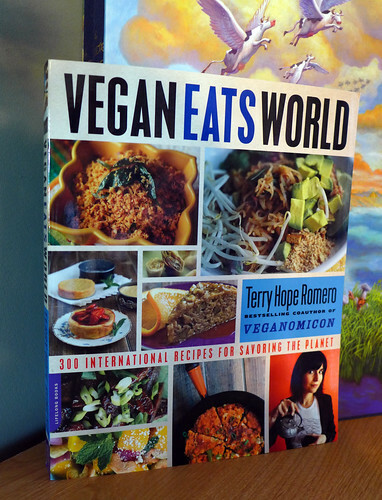 But longtime vegans (and I include myself in that category) might just discover a few new favorite recipes, too! Mayim’s Vegan Table begins with three introductory chapters about the environmental, nutritional, and ethical benefits of a plant-based diet, as well as tips and tricks on how best to introduce children to a healthy vegan lifestyle. (I must admit to skimming over these; show me the food, please!) There’s also a standard “stocking your pantry” chapter. The recipes are grouped into categories for Breakfast; Soups, Salads, and Sandwiches; Snacks, Sauces, and Dips; Veggies and Sides; Entrees; Breads; and Desserts. The dishes range from simple (Daiya-Style Pizza, Parsnip Fries, Cashew Cheese) to the more complicated (Creamy Enchilada Casserole, Hot Pretzel Challah Bread). So this is a pretty serviceable recipe for pancake batter. 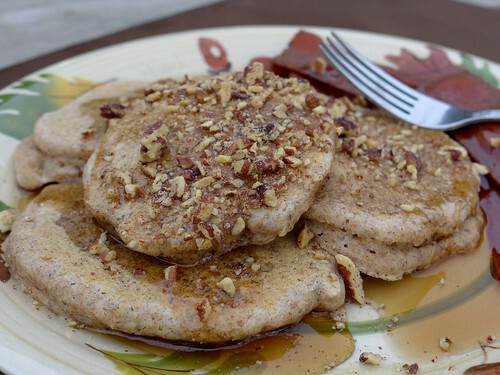 It’s not my favorite pancake recipe of all time – that’s a toss-up between Isa’s Perfect Pancakes (Vegan Brunch) and the Lavender Pancakes from Alicia Simpson’s Quick and Easy Low-Cal Vegan Comfort Food – but these pillows of carbs are tasty enough. They manage to be both fluffy and cakey at the same time, which is a feat in itself. It would have been nice if Bialik included a few original topping ideas to dress things up, though. This book does indeed feature fifty juicing recipes, but it’s a bit of a stretch to call it a “Bible.” In the short, 1 ½-page introduction, the author doesn’t list any tips or tricks for juicing beyond “wash your produce, remove any damaged bits, and serve immediately,” nor does he offer any advice about choosing and maintaining a juicer. Most of the 59 pages are taken up by the recipes…and a ton of white space. The recipes mostly seem to be somewhat standard fare as far as juicing goes. However, a few interesting combinations caught my eye: Wild Berry and Mint; Mango and Lavender; Fennel and Pear; Coriander Lime; Gazpacho; and Strawberry and Rosemary. I can’t wait to try them out once these fruits and veggies come into season! As a vegan, I’m kind of disappointed that the author relies on honey as a sweetener, and doesn’t suggest any vegan substitutions. Even so, I’d classify this book as “vegan friendly,” since any vegan worth her weight in Daiya knows to swap out honey for agave nectar, brown rice syrup, maple syrup, or plain old sugar. The format of the book can generously be described as “plain”: just a simple, 12-point Times New Roman font on a plain white background. There are no photos or artwork to speak of (or least not in the pdf copy I received for review). Each page contains only one recipe (where two could easily fit), resulting in a ridiculous amount of boring white space. The Juicing Recipes Bible is really more of a pamphlet than a book. It could really benefit from a pass through an editor’s hands, too. In just a quick read-through, I spotted several grammatical mistakes; less forgivable are errors in the recipes themselves, such as the Fennel and Pear Juice, which calls for both pears and “pear bulbs.” Additionally, Chung repeats his earlier advice to “drink immediately” in the directions of every. single. recipe., which starts to feel really tiresome, really quickly. While I assume that each recipe is meant to serve one person, I’m really guessing here, as none of the recipes include information about serving sizes. A belated (Two days late. I KNOW I AM THE WORST.) shout-out to Da Capo Books, who sent me a copy of Mayim Balik’s debut cookbook, Mayim’s Vegan Table. It dropped on February 11th, so you can grab a copy for your own bad self any time you want. I’ve already cracked it open and come up with a list of recipes I’d like to try. Naturally I gravitated right to the breakfast foods: Breakfast Burritos, Potato Hash, and Pancakes, yum! There are also a ton of Jewish recipes that caught my eye. Matzoh Ball Soup? Check. Root Vegetable Latkes? Yes please. Rugelach? You betcha! And two mac and cheese-style dishes? I am sold. 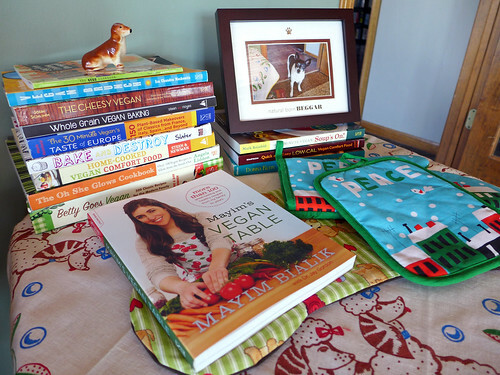 Also, and on a completely different note, don’t you just love my cookbook table? It started out as a place to stash the cookbooks I’m currently using but, as the cookbook shelf in the pantry filled up, it became overflow storage. Wanna take bets on how high I can pile the stack? I have a couple of feet until I hit the bottom of my Rat Terrier Coffee Bean Company poster. Serious cookbook addiction? Check and check.